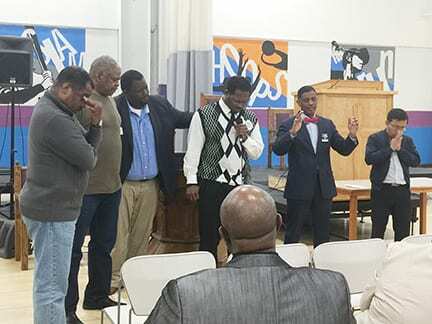 NASHVILLE, TN —The “When Men Pray” service showed a strong focus on youth. In 2017, there were 15 homicide victims age 17 and younger. 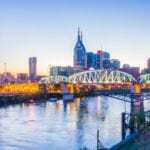 Since January 1 of this year, too many youth have been killed in Nashville, Davidson County. 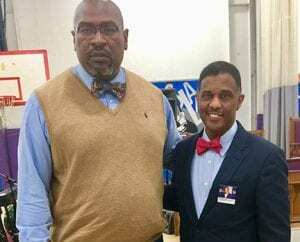 “With violence surrounding our lives, regardless of age, economic status or zip code, this is a time for men to stand up, be strong and pray, because prayer changes things,” said Pastor Howard Jones, Senior Pastor of Fairfield M. B. Church and candidate for State Senate, District 19. Rev. Hunter, a volunteer with the Boys & Girls Club, coaches a basketball team of children who are 7 & 8 years old. On the Friday night before the event, he was teaching by coaching and guiding young minds with structure, teamwork and fair play. “By encouraging children in sports, you get their attention and can encourage them in a holistic lifestyle, said Rev. Hunter. l-r; Pastor Thomas Hunter, Sr., Pastor, Nehemiah M. B. Church and Pastor Howard Jones, Senior Pastor, Fairfield M. B. Church. Other participants included, Dal Mang, who prayed about faith, Nesbit Harris, who prayed about fellowship and Folusho Micah, who prayed about the future. The service ended with a unity prayer for the church, the community, the city, the nation and the world. 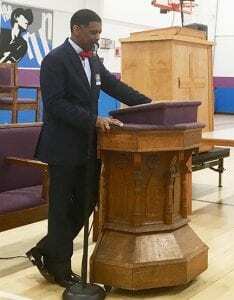 “As men, it is our responsibility to respect, protect and honor our women, children, the elderly and self,” said Pastor Jones.